The October meeting, led by Bob Torbet, was held at Jack Putnam's. The treasurer's report was given by Jack Putnam. We had a total of 12 members and guests present. Everyone was given a chance to introduce themselves. Bob gave a report on his tour with the Mad River T's in Miami County. 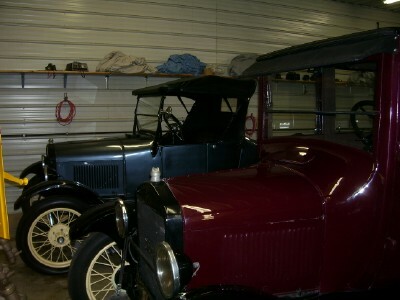 They visited D&D Classic Car Restoration. 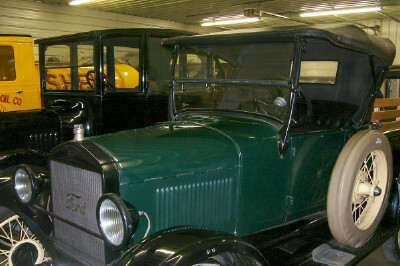 There were many cars in various stages of restoration. The cars on hand were an Auburn, Hudson, Labaron, Bentley, Franklin, and Stratford. In Jamboree news, we discussed some of the places that we would like to go. From a business standpoint, we need an ID number to open a special account for the Jamboree. Bob Hollister said that he would get the number for the account. Sue Cook will be the business contact for the Jamboree, with the account to be opened in one of the Tiffin Banks. The meeting was called to a close. We all had the traditional goodies and Jack demonstrated how to dig the old capacitors out of a coil box. Once Jack gave the demonstration, Dave Benny proceeded to try his hand at the activity. All in all, a very educational meeting. Dave Nolting is planning on doing a demonstration of Nickel plating for us at the November meeting. This should be a very interesting demo. 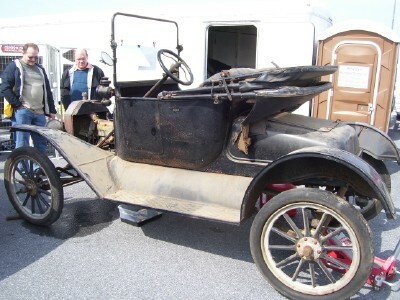 This is the much talked about barn fresh 1915 Roadster that was picked up from Western Pennsylvania on the way to Hershey. The guy worked on it throughout the day right at his site. 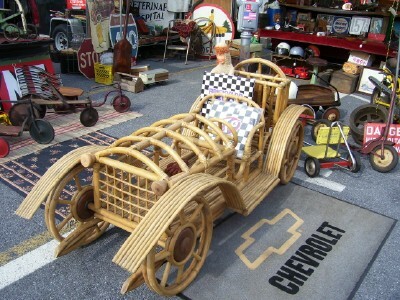 Once he was sure that it wasn't going to self-destruct, he took it for a few spins around the flea market. I looked the car over and found very little that had been changed over the years. The only real distraction was the paint that someone had done to the wheels. This is an example of some of the strange things that you can find at Hershey. This Bamboo classic would be the center of attraction in any living room around the country. I don't think that it ever sold. Sadly, it is in better shape than some of the actual cars that we saw in our four days at the event. It may even have a better chance of eventually running. If it was just there as an attention getter, it did the job. 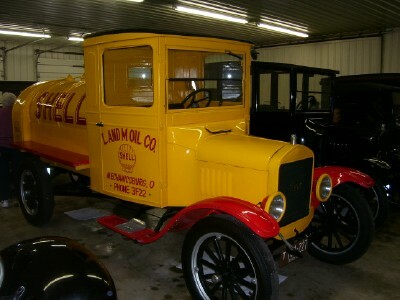 This 1914 truck had all of the charm that you could want in an early delivery vehicle. Most all of the T's that were on the field this year had some type of auxillary shock system. 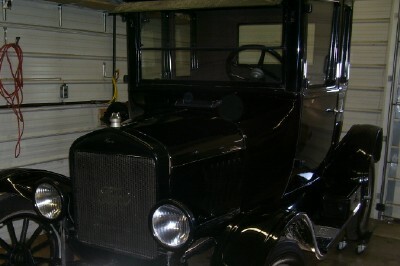 The car next to this one is a made up early Tulip style Cadillac. There is always something for everyone Hershey. I must add that this was the best Hershey in terms of weather that I have ever attended. A special thanks to the Creator for the day. 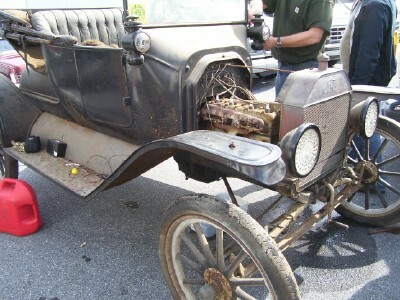 This is a sad fact of what happened to a lot of Model T's. This block was beyond repair; so, it went on to become another batch of molten metal. Jack did not stick around to see what would be cast from this small furnace. Having worked in an iron foundry as an anneal fireman for seven years, I can tell you that what you are seeing in the picture is a mix of scrap iron, pig iron, sprue from the previous day's casting, and some manganese. Just remelting old metal never creates a good casting. 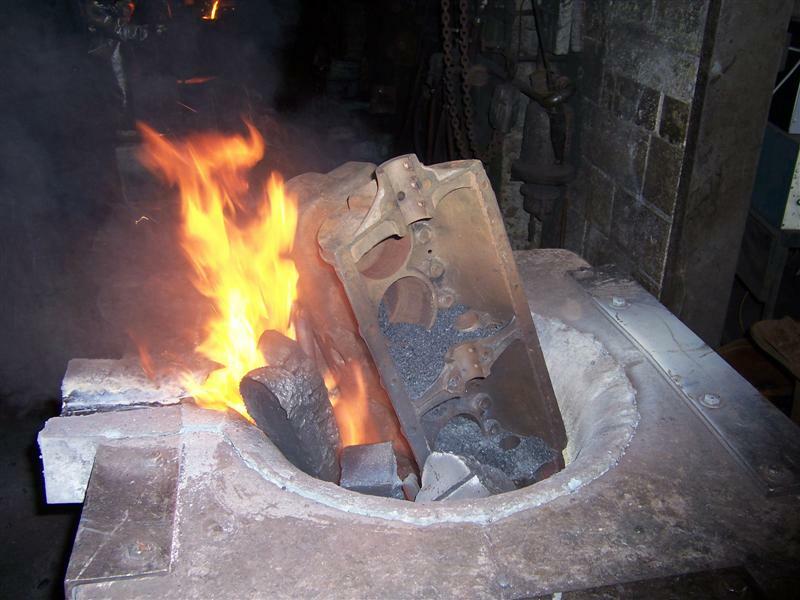 Iron continues to lose carbon every time it is remelted. Eventually it becomes dead iron that is missing all of the properties that we value in a good casting. 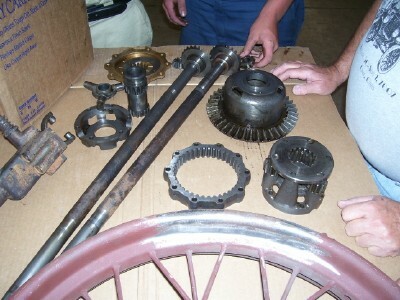 The guts from a ruckstell rear end were laid out on the table to demonstrate what to look for when inspecting for worn parts. Suprisingly, some assemblies are in rather fine shape for one reason or another. Never assume that just because a rear axel housing is rusting in the woods that the gearing hidden within is in bad shape. 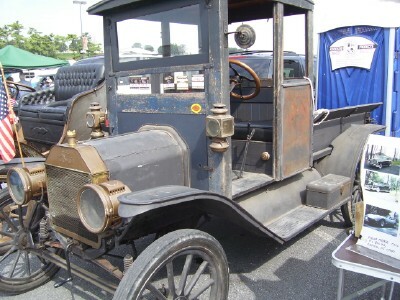 The Model T could have been wrecked right after the ruckstell was added. 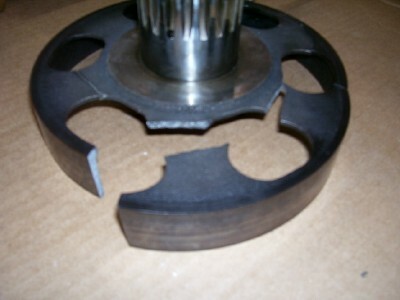 This is the low speed drum that had evidence of a long standing crack. It was removed from the engine and replaced in four days. Its amazing what you can do under time pressure. These are both demonstrations from the September meeting. The October demonstration was replacing the capacitors in coil boxes. Jack showed us how to dig the old capacitor out of the coil box and replace it with a modern one.